The new K9 MetroExtra route serves the New Ave, running between Fort Totten Metro Station and the White Oak FDA Campus. 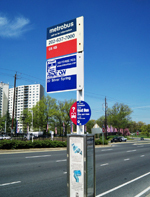 This limited-stop service adds buses to one of the busiest bus routes in Maryland, during both the morning and evening rush hours. Download the timetable for the K9 and get moving on the New Ave! Move beyond the asphalt of the highway, and explore international shopping, dining, and professional services right here on the New Ave! This website is maintained by the City of Takoma Park Planning Division, and is intended to help you discover opportunities on the New Hampshire Avenue corridor. Questions? Contact the Planning Division at 301-891-7119, or planning@takomaparkmd.gov. Join the New Ave email list and stay connected. This bimonthly blast goes out to 500+ New Ave business operators, property owners, residents, and decision makers with updates on ongoing projects and upcoming events. Subscribe today.